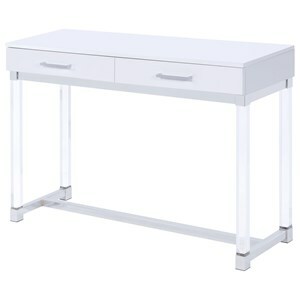 Combining chrome, acrylic, and painted wood finishes, this writing desk adds a light, airy feel to any home office space. 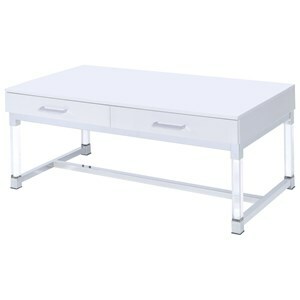 The desk includes two drawers to meet your storage needs. 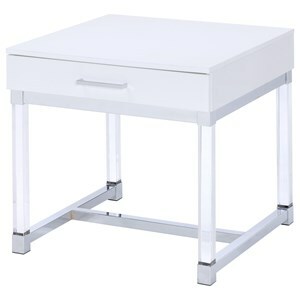 The Everett Two Drawer Writing Desk with Acrylic Base by Steve Silver at VanDrie Home Furnishings in the Cadillac, Traverse City, Big Rapids, Houghton Lake and Northern Michigan area. Product availability may vary. Contact us for the most current availability on this product.